description: After France fell under Nazi control in 1940, Jews across the country were forced to register with local authorities. The Jews of the city of Amiens were no exception, and the majority were later murdered. For decades, their names and photographs were tucked away in a government building in Paris. Slowly, they began to fade from the collective memory of their former neighbors. Pittsburgh-based historian David Rosenberg has spent years working with French residents and officials to unearth the stories of the Jews of Amiens. Through his diligent research, letters, photographs, and various documents have finally been made available not just to the residents of Amiens, but to the public. 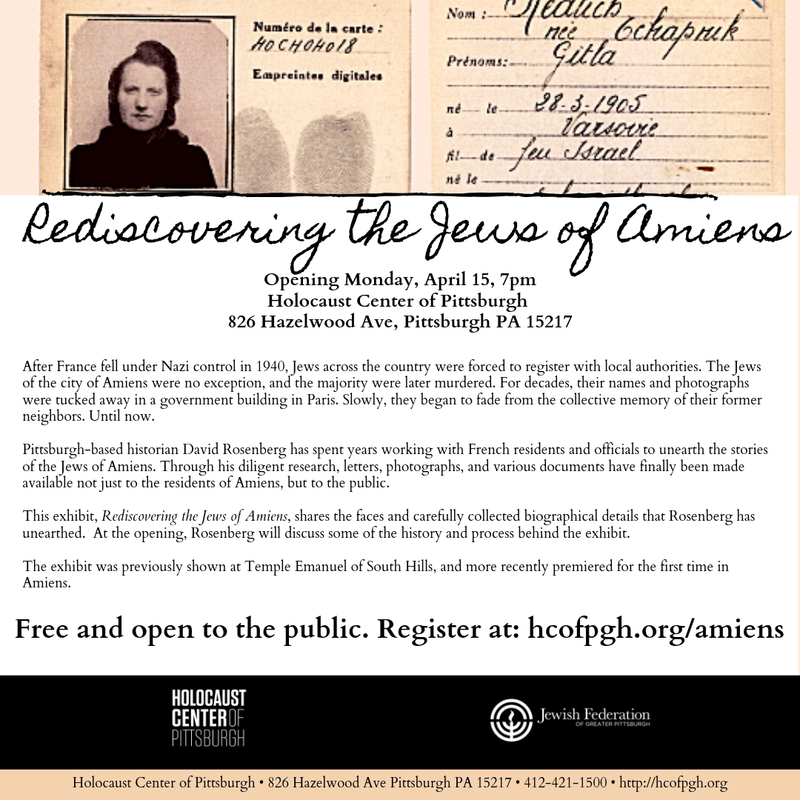 This exhibit, Rediscovering the Jews of Amiens, shares the faces and carefully collected biographical details that Rosenberg has unearthed. At the opening, Rosenberg will discuss some of the history and process behind the exhibit. The exhibit was previously shown at Temple Emanuel of South Hills, and more recently premiered for the first time in Amiens.